This post is based on a short speech that Sapphyre Miria of Commonwealth Seeds and I gave at the Charlottesville Gaia Gathering in May of last year. Cowpeas (a.k.a. 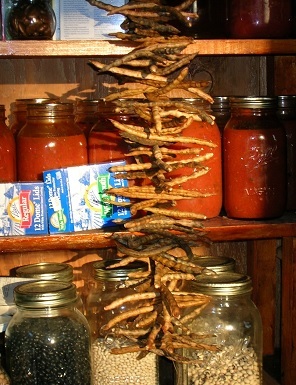 southern peas or field peas) dry on a string in a home pantry, at a scale appropriate to home seed-saving or food preservation. Preserving seed for the next season has been a fundamental rule of survival throughout human history. And yet in our time, dependence on commodified seed is a huge insecurity to our local food systems. Almost all seed prior to the 1930’s was organic, regionally adapted and open-pollinated (non-hybrid). American seed companies first arose in the latter half of the 19th century, but in 1940, most farmers and gardeners still knew how to save seeds of most or all of the vegetables, herbs, flowers, and other plants that they grew. When they traded and shared these seeds with their neighbors, they passed the knowledge along, too. A variety stewarded in this way has a genetic makeup suited to the local traditions and the local growing conditions. This adaptation of seed stocks allowed for a diverse, secure food supply in each region. This began to change with the advent of hybrid corn varieties in the 1930’s. With outcrossing crops like corn, onions, and broccoli, hybrid vigor is a significant factor, and that’s why we carry two hybrid sweet corns, a hybrid broccoli, and a hybrid onion, in addition to about 800 open-pollinated varieties. However, around 1940, farmers started trading in their ability to save next season’s seed, adapted to their growing conditions, for seeds purchased from a seed company and promises of better yields. In the years since, using hybrids (which don’t come true to type if you plant seed you’ve saved) has become standard practice even for plant types that don’t benefit from hybrid vigor — and most don’t. Over the latter half of the twentieth century, farmers and gardeners continued to lose their seed-saving knowledge and their stewarded varieties. Industrial food systems replaced local food systems just as industrial seed systems replaced local seed systems. Throughout this process, seed has moved away from being the held in common by humankind, and joined the long list of resources appropriated by the private sector. The results have been devastating. Most farming in the United States today relies on proprietary seed stocks, whether simply hybrid (F1), or plant variety protected (PVP – a limited patent), or genetically modified (GMO), the most extreme form of seed privatization. The seed industry is now dominated by a handful of transnational biotechnology/chemical firms with 60% of the world’s commercial seed owned by 5 companies. What’s worse is that these corporations have no interest in supporting sustainable organic agriculture or organic crop breeding. In fact, their profits rest on breeding crops that rely on agricultural chemicals, which they also sell. They have much to gain by commandeering the seed supply through market consolidation, discontinuing more seed varieties with each corporate merger, and leaving fewer varieties available to organic farmers. 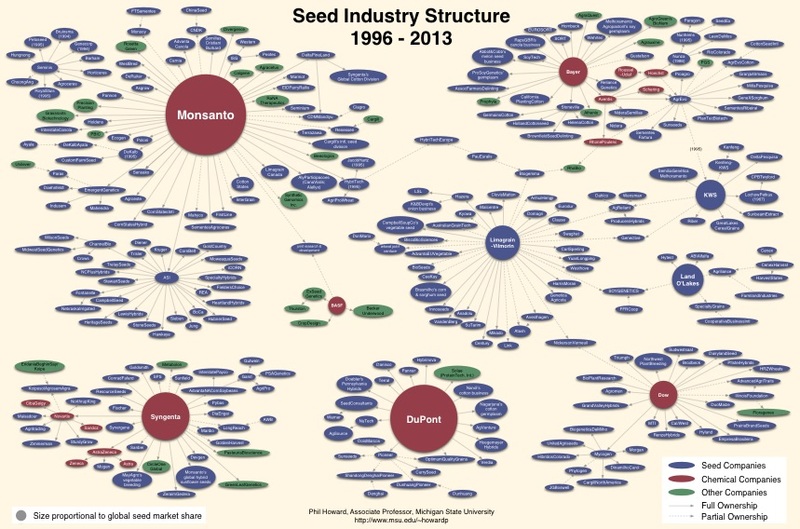 Chemical companies have been buying out seed companies for decades. 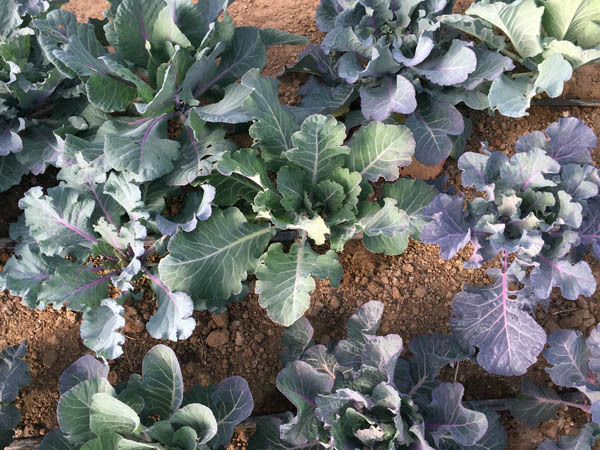 Hybrids and other newer varieties are generally bred for shippability, appearance, and the ability to perform well in high-input, chemical-intensive monocultures. Even universities sometimes patent varieties and sell exclusive rights to monopolize those varieties. This privatization has led to increased reliance on hybrid seed stocks, and also to a loss in the amount of open pollinated varieties available, and also a loss of their quality, suitability and traceability. Most commercial dry seed production takes place where the climate suits the seed production, like the Pacific Northwest and Israel. That’s great in some ways, but how will those varieties grow in an opposite climate like the southeastern United States? Colorado is a good place to produce squash seed without much of the disease pressure experienced in more humid climates. But over the long run those seed stocks are not likely to hold up as well to Downy Mildew and Bacterial Wilt. Mainstream, conventional agriculture produces increased rates of various diseases in people, too. In this country we have epidemics of obesity and diabetes, despite increased advice on what, and how much, to eat. Once in a while, conventional breeders select for higher nutrient content, but it seems that every decade there are significant changes in which nutrients we’re told to pay attention to. Likewise, disease resistance and regional adaptation are sometimes, but rarely, prioritized by modern vegetable breeders. The political landscape surrounding seed is dire and reveals the vulnerability in our local food systems. Yet, there exist many seeds of potential to turn the tide of corporate control over our food supply, and to return food sovereignty to the hands of the people. Communities that prioritize local spending, farmer co-operatives, food hubs, farmers’ markets and CSAs are also becoming the breeding grounds for a new local, organic, open-pollinated seed movement. 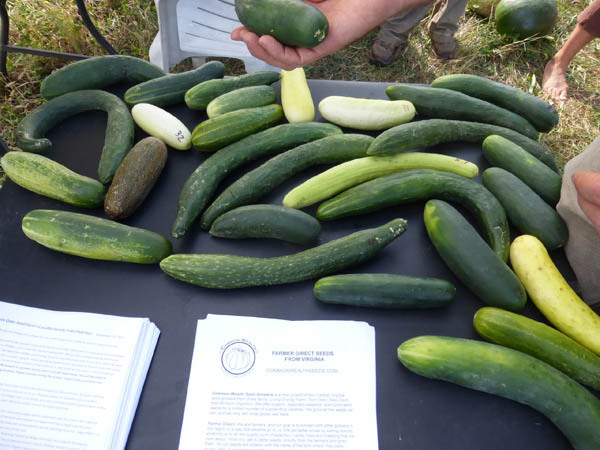 In Central Virginia, Common Wealth Seed Growers and Southern Exposure Seed Exchange are working together to create a robust seed system that meets regional needs. We’re creating access to well stewarded, source-transparent, regionally adapted, GMO-free, organic, open-pollinated seed varieties. Common Wealth grows, saves, cleans and packs all of the seed they sell, and also maintains several in-progress breeding projects. This year Southern Exposure is partnering with Common Wealth and adding three of their best-performing varieties to our collection. At Southern Exposure, we are working with over 60 small farmers who grow seeds. For 2018, we’ve increased our source transparency: all the seeds grown on the small farms in our seed grower network now have an “S” symbol. This replaces the “e” symbol that had a similar meaning, but that we only used for seed that’s not also certified organic. We offer some varieties recently bred for organic production, but we focus on heirloom varieties, which have stood the test of time. They have been passed down from generation to generation. The heirlooms we carry (marked with the hourglass symbol in our catalog and on our website) have also stood the test of our trial gardens. Some of the heirlooms we offer might disappear if we didn’t offer them. Heirlooms are often less uniform than newer varieties, in part because the uniformity that industrial farmers seek can be a disadvantage to home gardeners. For example, when you’re growing for your own kitchen, you don’t want all your broccoli to mature in the same week. Together, Common Wealth and Southern Exposure grow and test new and old varieties in our trials and collaborate to expand the number of trials we can do during a growing season. We are building local and regional networks of skilled organic seed producers, and teaching seed-saving techniques to farmers and gardeners. We practice ongoing selection under organic conditions. This work is an essential piece of the larger mission of creating an agricultural system that produces foods that nourish us deeply.